I’m an obsessively avid reader. If you let me, I’d do nothing but sit in a corner reading a book in one hand, with the Texture app open on an iPad, and my phone close by to check Twitter, the New York Times or the Washington Post. When you have toddlers and your own business, real life intrudes on that inclination to turn into a moldy lump of knowledge. Those brief interludes usually get shoved into the time between getting ready for bed and actually falling asleep, drooling on my Kindle. This is a dense book on the subject of mastery, what it takes to get there, stay there and how to find your calling. It’s full of inspirational historical figures and stories of current cultural icons and anecdotes. The first chapter is the kick in the pants we all need to start 2017 off with an awesome firecracker of a beginning. Find your niche, refuse to be ruled by the past and move ahead confidently – this is the book to set you on that path. Willpower, discipline…it’s an area we all struggle with. If we didn’t, we’d all be zenned out, healthy and have savings accounts that reflected our ability to just say ‘no’ to the new sweater, daily latte and latest gadget. This book is based on a Stanford course that proved so useful that the course quickly grew to encompass community members as well as enrolled students. It gives not just anecdotes (which are interesting all on their own) but practical tips and strategies to improve your willpower and keep promises to yourself. This book reads like fiction but is true, in a hilarious and cringe-worthy way. As someone on the outskirts of the Seattle tech scene, I’ve seen the race to ignore fundamentals, focus on growth for growth’s sake and outfit your office with the coolest thing. Side note, I personally know one company with a drink cart that comes around at 4 p.m. every day and multiple companies with kegs in the office. This is a book for everyone who has thought their manager was out to lunch (both metaphorically and figuratively) or anyone that just wondered why Snapchat was worth similar amounts on paper to BMW and Nike (who make actual physical products that you can see, smell and touch). This ridiculously clever book skewers our self-improvement race to the most zen, most esoteric, most yoga-rific peaks we can spiritually (or legitimately) scale. Anyone who has been in a relationship where one partner goes on a self-improvement journey without the other will feel a twinge of recognition as they read this book. It’s not a mystery, although there is a mystery to solve. It’s more of an exploration of what it means to be in relationship with another person, with yourself and with reality. Delving into why we work, identity and romance, this book was not just a fun read but a thought-provoking one. And the ending floooooorrrrrred me. Like, seriously shocked me. Is there anything sweeter than people falling in love? Yes, there is. There’s an even better story to be told when deeply kindhearted, outlier people fall in love against their better judgement. This story is about an introvert and an extrovert who decide to embark on a relationship together after some hilarious and delightful missteps. It’s sweet, it’s hilarious and we all know someone like Don (the socially awkward professor and scientist) and Rosie (the free spirited waitress). Read it to laugh and believe in true love again. My book club was deeply divided over this book. I loved every word of every page. Half of the people in book club hated the book and then grudgingly came around at the halfway point. So with that ringing endorsement, why should you read it? You should read this book to be reminded there is goodness in the world, sweetness in everyone and that people can come together, no matter what the circumstances, to love each other and be good to each other. Ove is the crotchety old man we’ve all seen portrayed in movies, or maybe we know one or two. Despite his desire to be left alone and be miserable, he keeps getting drawn out of his home to inadvertently (or is it on purpose?) help people. And, in doing so, help himself as well. I cried when the book was over – good tears. Yes, I’m biased since I wrote this book. But, more than one hundred 4.5 star reviews on Amazon agree that this is a fantastic beginner book (and the ones that are less than 5 stars usually take offense to the use of pigments and oxides for color. #notbitter 😉). This book also contains quite a few inspirational advanced techniques. 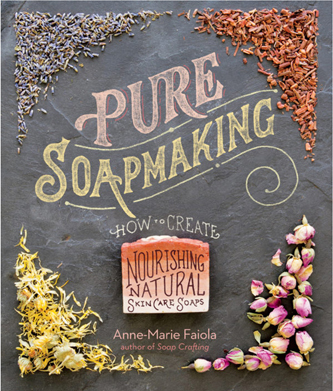 Covering milk soap, beer soap and all things natural, this book would make any DIY’er happy.